'It's like something is going into that engine and 'braaap!' They have such a powerful engine in that area."' - Marc Marquez, Austrian MotoGP. Marc Marquez was only fourth fastest during the lone dry session on Friday at the Austrian MotoGP. But unlike the Ducati riders ahead of him - Andrea Dovizioso, Jorge Lorenzo and Danilo Petrucci - the 2018 title leader was the only leading rider to stick with the same tyres during the whole of FP1. Nevertheless, the Honda star says Ducati and especially Dovizioso still hold the advantage at the power-hungry Red Bull Ring circuit, where the Desmosedici has reigned supreme since MotoGP's 2017 return. Marquez, who went on to lead the wet afternoon session, said: "Of course it was a good day because in the dry, since I go out, I feel okay. I had a small problem on the [first] run, but I was able to find a good confidence with the bike and track. "We didn’t put a new tyre because it's our plan. I mean, the plan was to try the medium to see how it was on the last laps of the race. It was good, because I did a good lap time, even on the last section we tried something in the set-up that improved. "In the wet in the afternoon we were good. We just did a few laps to try the electronics, try the set-up. "But on Sunday it looks like it will be dry and I'm confident, but Ducati is strong. I mean you can see first, second and third Ducati. Especially Dovizioso is very, very strong." Marquez, who lost out to Dovizioso after a final lap showdown a year ago, confirmed the Ducatis are gaining on the straights, especially once they get into fourth gear. "The key to acceleration here is the wheelie. It's not because you don’t have enough torque. When you manage the wheelie in a good way then the acceleration is much better. I don’t feel a very big difference [to last year's Honda engine] but of course when I put fourth, fifth, sixth we have a little bit more power this year. "But still Ducati ion the top speed is around 3-4-5km/h faster than us and on those three straights this makes the difference. But we can improve in the middle of the circuit that is our strong point." Pressed on the Ducati advantage, Marquez added: "It's especially when they put four-fifth gear, it's like something is going into that engine and 'braaap!' They have such a powerful engine in that area." But is Marquez just building the Ducatis up, to try and deflect from his and Honda's impressive pace? "Just I try to check the [timesheets] and understand where we are," he replied. "Of course, I would like to say we are the fastest and I want to win on Sunday. And I want to win on Sunday. And when it's the time like in Sachsenring and Austin, I say. Straight away because I believe[I can win]. "But here today, for example in FP1 we were very fast, competitive, but there was specifically one rider - Dovizioso - who was slightly faster than us. So we need to improve in some areas to try to be like him." "In the wet, the grip was very good. Better than I expected. On the brake points I was a little bit careful because last year we had many, many crashes but in general the feeling was good." One particular place on the circuit is scary whatever the weather – the turn two kink that leads into the Turn 3 braking zone. "That corner maybe is the most dangerous point on the circuit," Marquez said. "I mean it looks like the runoff area is enough but we arrive around 290-300 in that corner and especially when you go in, it's not the problem because you lean but not much. "The problem is that you start to brake with some lean on the left side and in that area it's better to lose one tenth, because a crash there and you are injured for sure. So it's the most physical point of the circuit for that, because you start to brake on the left side. It's dangerous for the speed, but I think the run-off area is enough." Lorenzo will move from Ducati to become team-mate to Marquez at Repsol Honda next season. 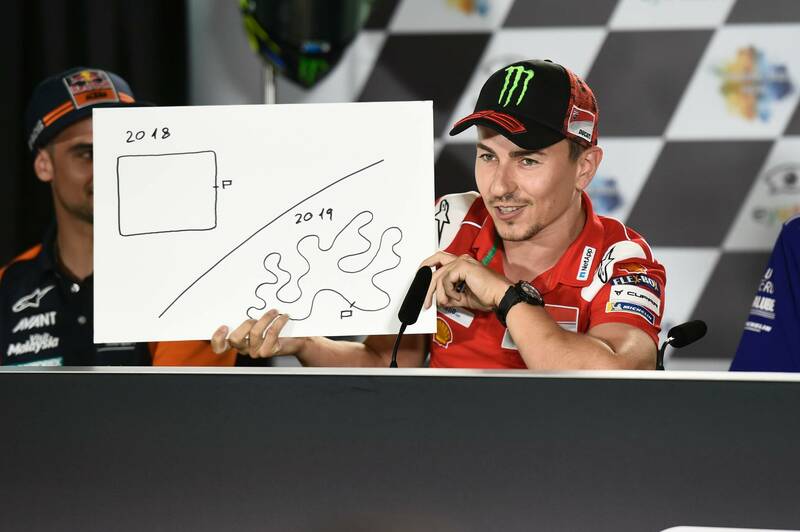 On Thursday, like Marquez, Lorenzo was asked to draw his dream circuit and entertainingly came up with two designs. The first, for 2018, was just a square, illustrating the straight-line strengths of the Ducati. The second design, for 2019, was an endless series of twists and turns. But is that really the kind of track that suits the Honda? "I say to him already, of course for the 2018 Ducati it's a good circuit for his bike. But that  layout - there are some corners that the Honda is not working!" Marquez said. "The long corners, if you want to have good turning there you need to chose a Yamaha because they are really strong there. "But we are trying to improve our bike to be competitive in all layouts. That's the direction. Already this year we made a small difference and it's like I said at Sachsenring, we are stronger on the weak points and we suffer a little bit more in our strong points compared to last year." Meanwhile, Marquez's team-mate Dani Pedrosa was sixth (dry) and then 23rd (wet) on Friday. "The track was completely dry in the morning, so we tried to be as fast as possible because of the high chance of rain in FP2. We also hoped to take full advantage of the session, to understand as much as possible the track and the tyres. "This afternoon I did just a couple of laps, just to check the tyres and the grip in wet conditions, and it was better than I expected. Clearly, it would be a problem if the rain gets really hard. "The weather here changes very quickly, so it was important to try and understand the feeling we were able to get, but anyway the conditions should be better tomorrow."